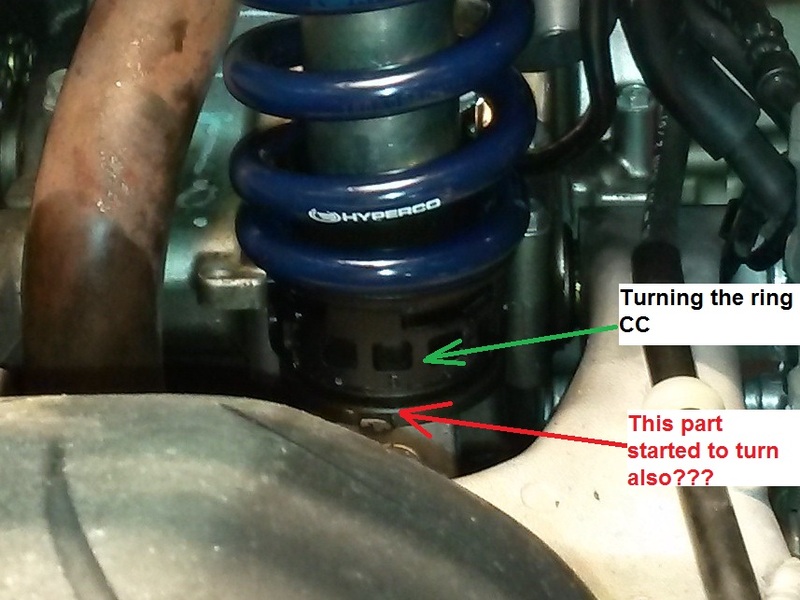 Anyone successfully adjust the preload on their DMR (CBR600) rear shock? I bought the CBR600 spanner. Tried using a ladder and straps on the subframe to take some load off the spring but that sucker doesn't want to move. The whole bottom assembly starts to move (see pic) so I stopped because I was afraid I was going to break something. I was turning counter clock wise for less pre-load. Last edited by mikenap; 06-10-2015 at 04:42 AM. can you hold that notch on the lower part with something? These are obvious. And hard to move. The bottom bit turning is normal, it is captured. It cant go anywhere. I can't get mine to move either. In either direction. Love the shock though. Spray a bit of WD40 on the shock where the adjuster turn around the body of the shock. It gets some of the curd out and gives it a little lube which normally frees up the adjuster. Has to be unloaded, for sure, and I had to compress the spring on mine to turn the adjuster. 1) It is helpful to have the shock unloaded but this is not necessary. 2) There is over 1000lb of preload force on the spring, keep this in mind when trying to turn the adjustment. There is a considerable amount of friction under that load so you will need to overcome that before it will turn. 3) The lower part of the shock can spin and it will not hurt anything. Just stick a screwdriver in there to align it with the upper mount for installation. Probably the biggest advice I can have is to understand what that adjustment does - it is ride height. Almost always this is considered to make the shock softer/stiffer but that is not what it does at all. It only changes the height of the rear of the motorcycle. The feel of the suspension is controlled by the damping. If you are getting the correct total rider sag (in our case 30-40mm) then you are ok. Make adjustments to the preload to get your sag in this range. This is a "set it and forget it" adjustment, unless you lose/gain a lot of weight (40lb or more) you will not need to touch that adjustment again for the life of your motorcycle. ...If you are getting the correct total rider sag (in our case 30-40mm) then you are ok. Make adjustments to the preload to get your sag in this range. 1.Let's say for instance it would be ideal for me to lower my seat about 1/2 an inch(13mm or so) is this how I would do it? Because I've been thinking that I would have to get a new spring. 2. When you say rider sag I assume you are talking about how much the bike sinks when I get on. Right? It would depend on where your spring preload setting is now. You might be able to lower by that much, but honestly I kind of doubt it. Rider sag is the difference between when you are on the motorcycle and with the rear lifted all of the way up with no weight on the rear wheel at all. This measurement usually takes two people to record, so you'll want to get a buddy to help you out.